The Airbus A400M new generation airlifter has further expanded its capabilities as a tanker by successfully demonstrating air-to-air refuelling contacts with another A400M. In two flights conducted from Seville, Spain the development aircraft performed more than 50 contacts in level flight and turns using the centreline hose and drum unit (HDU). The A400M is the only tactical tanker on the market with this third refuelling point, in addition to its underwing pods, enabling refuelling of large receivers such as another A400M or C-130. It has a basic fuel capacity of 63,500 litres, which can be increased with two extra cargo hold tanks carrying 7,200 litres each, and can refuel from the HDU at a rate of 2,000 litres (600 US gallons) per minute. 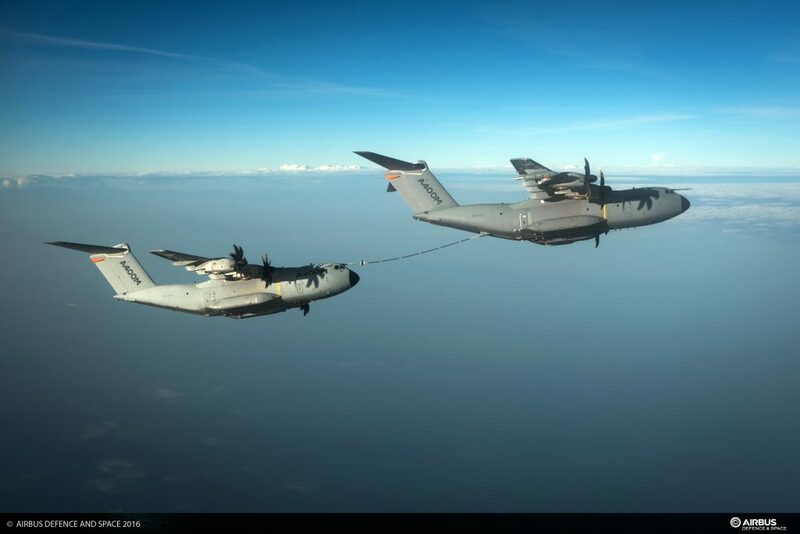 The technique would allow the A400M to carry a 20 tonne payload more than 6,000nm / 11,000km non-stop from Paris, France to Kuala Lumpur, Malaysia. The standard A400M aircraft has full provisions for air-to-air refuelling (AAR) operations already installed and only requires the rapid installation of the optional air-to-air refuelling kit to become a tanker. The A400M was launched in May 2003 to respond to the combined needs of seven European Nations regrouped within OCCAR (Belgium, France, Germany, Luxemburg, Spain, Turkey and the UK), with Malaysia joining in 2005. 2009The A400M made its first flight on 11 December 2009. The first production aircraft was delivered to the French Air Force in August 2013 and in service a year after. The A400M already has seen operational use with the French and Turkish Air Forces in Afghanistan, the Central African Republic, African’ Sahel Region, Mali and in the Middle East to support the air operations over Iraq and Syria.